Spend a night learning to capture the beauty of Nantucket & Martha's Vineyard's dark night skies with award winning photographer Chris Cook. Chris' work has been published worldwide including National Geographic, Canon USA, Caltech, Astronomy magazine, Sky & Telescope magazine, Massachusetts Institute of Technology and is a 11x NASA 'Astronomy Picture of the Day' (APOD) recipient. Spend the night on the beautiful island of Martha's Vineyard. Located just 4 miles off the coast of Cape Cod, the skies here are darker than those found on the MA mainland. We will meet in Vineyard Haven on May 7th (August 26th) by 4pm to meet each other, talk gear and techniques and also have an early dinner before heading out for the night. Meeting location TBD. * first stop of the evening will be East Chop Lighthouse, a classic New England maritime beacon that would be good for star trail shooting. * second stop will be Edgartown Lighthouse. The well know light will be a great foreground object just as the Milky Way starts to rise in the eastern sky. * third stop is going to be Gayhead Lighthouse in Aquinnah where the Milky Way will be getting higher in the eastern sky and the galactic core of Sagittarius clears the horizon. * final location of the night will be Lucy Vincent Beach. Famous for its beautiful water and sand during the day, the beach also contains some amazing cliffs and rock formations which will make for some spectacular foreground objects in our Milky Way photos. Dawn will begin to break the horizon around 5am ending our workshop. You can catch an early morning ferry back to the Cape or you could chose to spend the rest of the day touring on island on your own. *Note* - the workshop will require you to bring your car over to the island via ferry from Woods Hole. Dinner, ferry costs and transportation on island is not provided as part of the workshop. Spend the night on the spectacular island of Nantucket. Located 23 miles off the coast of Cape Cod in the North Atlantic, the skies here are the darkest you will find anywhere in Massachusetts and Southern New England. We will meet in Nantucket Town on June 3rd by 6pm to meet each other, talk gear and techniques and also have dinner before heading out for the night. You could do some sightseeing and photography of the harbor and quaint streets in town if you were to arrive earlier in the evening. Meeting place TBD. * the first location will be Great Point Lighthouse. Located at the very NE tip of the island, Great Point is only accessible over sand via 4WD vehicles. A 4WD Jeep or similar will be provided for all four participants. Once the sky is dark around 10pm, the Milky Way will be well placed in the eastern sky from this location. We will be spending many hours here. * After Great Point, we will drive south to Santaky Head Light located in the village of Siasconset. * The sky begins to brighten around 3:30am signaling the end of our night. 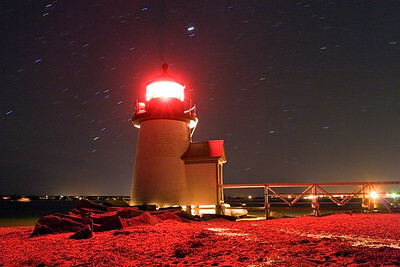 We will drive back into town to photograph Brant Point Lighthouse in the approaching dawn. This well known lighthouse guards the entrance to Nantucket Harbor. *NOTE* - the workshop will require you to take the ferry to/from Hyannis or Harwich Port. Dinner, ferry costs, transportation to/from the island is not provided as part of the workshop. 4WD jeep rental while on island is provided. You will learn to photograph the Milky Way and stars, including correct exposure/camera settings, composition and painting with light. - DSLR. Each participant must know how to work their DSLR. MILC (mirrorless cameras) welcome. No point & shoot, tablets or phone cameras. - Tripod. Must be sturdy enough to hold your camera's weight in a slight breeze without shaking. - Extra camera batteries that are fully charged. - Flashlight and/or headlamp capable of both red and white light. - Beach/camp chair (optional). You'll be on your feet a lot. Payment may be made via PayPal, check, money order or cash. Please contact me at chris@cookphoto.com for payment details and workshop availability. All payments are non-refundable. If the weather looks to be a washout (rain and/or total cloud cover), I will reschedule the workshop for a rain date TBD. This decision will be made by 11am the day of the workshop. The weather on The Islands can be unpredictable. If the workshop is canceled because of poor weather, your payments can be applied towards a future workshop (dates TBD). If you are unable to attend the rescheduled workshop because of personal reasons, you may attend another one at a later date (based on availability).